Rocket ships destined to explore the distant reaches of the universe begin their journey on the launch pad. Prior to lift off, there’s a lot of focused, challenging work that goes into preparing for ignition. Mechanics make certain all the nuts and bolts are torqued and tightened, engineers check the data, fuel tanks are filled, gauges are checked and calibrated. Parents, educators, and academic administrators prepare their children, students, and charges for life beyond high school like youthful rocket ships—providing opportunities, education, and love—preparing them for life beyond the college prep classroom. Hilton Head Christian Academy’s Diploma with Distinction program is providing students with the fuel for an exceptional launch. Students committed to participating in the school’s capstone program are given the opportunity to complete a long-term project of real world significance within their chosen future field of study. Approximately 25 percent of this year’s senior class committed prior to their junior year to completing the two-year, five-module program, culminating in a dissertation-style phase where each student presents and defends his or her work before a panel consisting of a faculty board, principals and headmaster, Dr. Daniel Wesche. Defined as a model-generating program, Hilton Head Christian Academy’s capstone projects propose real world ideas in an academic environment. 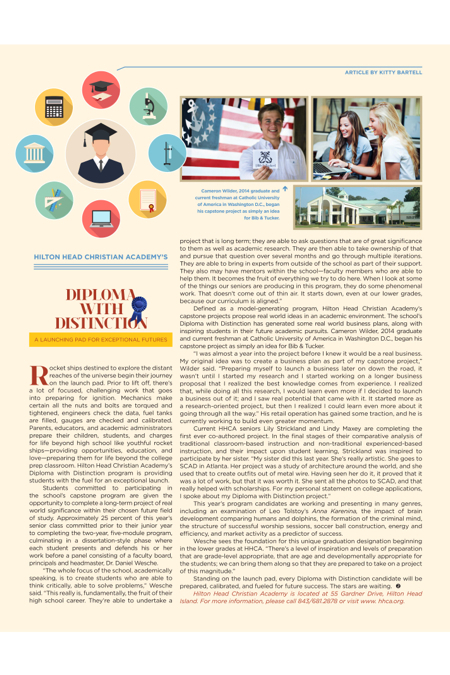 The school’s Diploma with Distinction has generated some real world business plans, along with inspiring students in their future academic pursuits. Cameron Wilder, 2014 graduate and current freshman at Catholic University of America in Washington D.C., began his capstone project as simply an idea for Bib & Tucker. “I was almost a year into the project before I knew it would be a real business. My original idea was to create a business plan as part of my capstone project,” Wilder said. “Preparing myself to launch a business later on down the road, it wasn’t until I started my research and I started working on a longer business proposal that I realized the best knowledge comes from experience. I realized that, while doing all this research, I would learn even more if I decided to launch a business out of it; and I saw real potential that came with it. It started more as a research-oriented project, but then I realized I could learn even more about it going through all the way.” His retail operation has gained some traction, and he is currently working to build even greater momentum. This year’s program candidates are working and presenting in many genres, including an examination of Leo Tolstoy’s Anna Karenina, the impact of brain development comparing humans and dolphins, the formation of the criminal mind, the structure of successful worship sessions, soccer ball construction, energy and efficiency, and market activity as a predictor of success. Hilton Head Christian Academy is located at 55 Gardner Drive, Hilton Head Island. For more information, please call 843/681.2878 or visit www. hhca.org.